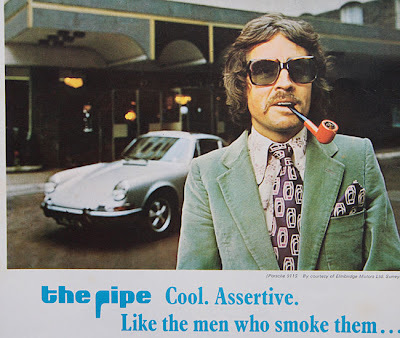 After posting the previous piece about dubious-looking pipe smokers, I looked up "Venturi Pipes" on the eenternet-thingy and discovered that the company that placed the ad in the UK was a subsidiary of an American one, AND someone out there - actually a Dr. Billie Taylor from the United states - has a website devoted to Venturi Pipes in their many manifestations. We have exchanged correspondence on this important slice of 1970s sociological history. Gripping, n'est ce pas ? Thank you, John. If Venturi-pipes, Ltd. followed the practice of Venturi, Inc., it advertised twice yearly; Father's Day in June (does GB celebrate that?) and Christmas. I have been searching for back issues of The Cricketer but none of the libraries I have contacted has even heard of it. A bit of online research has turned up information about the twists and turns of ownership that the magazine has endured over the last several years, but archived articles (not complete issues) online go back only to 2006. Well, the search is more than half the fun and I shan't impose the saga of it upon you. You're welcome to the picture! But I don't think they advertised very often. That advert was inside the front cover. There may have been others in black and white hidden away that I didn't notice, not being a smoker. Thanks for the laugh. As a collector of all things the pipe, I have taken the liberty of capturing from your web site your scan of the ad from the June, 1972, edition of "The Cricketer" and entreat you for more of the same if you can locate them. One wonders in what other publications Venturi-pipes, Ltd. placed ads. This is the first I had ever heard of. If the British company followed the US company's lead, they placed very few ads in very select magazines and newspapers. Now to find a library in the US that has back copies of The Cricketer and start working my way through ten years of them. Surfing a bit on your blog, I note that we share another interest - birding! Your photos are stunning. I have never pursued World Birding, but your blog makes it very attractive. Here in Tropical South China, the summer is upon us. The late spring migrants of May have gone through, and the resident birds are feeding young and being secretive. NOW is my chance to go "Off Topic". I'd like to start with an advert from the June 1972 edition of "The Cricketer" magazine. I was a loyal subscriber for many years. I've never pretended to be trendy, but even as a fifteen-year-old I knew something was horribly amiss with this photo. On Saturday, 1st June, we went to Po Toi Island on the ferry from Aberdeen. Apart from two other couples intent on bird photography on Po Toi there weren't many people on the boat. On arrival, Po Toi seemed hot, steamy and birdless. We met Geoff Welch - "Mr Po Toi" - who was just leaving. Geoff confirmed our suspicions. Most of late May's migrants had cleared out, and so did we. 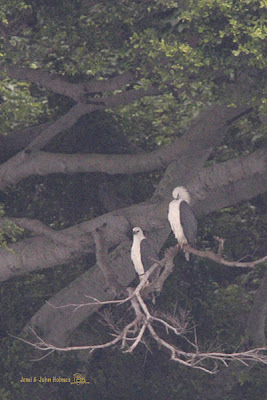 Birds of the day then, this pair of White-bellied Sea Eagles between Abeerdeen and Po Toi.